These are very rich cookies (as are most shortbread cookies) yet somehow lighter and melt-in-your-mouth good. Be sure to make extra because these will go fast! In the bowl of a stand mixer, add the butter and mix until light and fluffy, about 5 minutes. Scrape the sides of the bowl and add egg yolks and 1/2 cup confectioners' sugar. Mix well. Add the ouzo, vanilla, and the toasted chopped almonds. In a separate bowl, sift the flour, baking powder, and baking soda together. With the mixer on low, add the flour to the butter mixture and mix until incorporated. You don’t want to over mix the dough because that will toughen the cookies. Chill the dough for about half an hour to make it easier to handle and roll. Heat the oven to 350 F. Have ungreased baking sheets at the ready. Remove the dough from the refrigerator. Take a piece of dough about the size of a walnut, roll it into a ball, and place on the cookie sheet, spacing 1 inch apart. Alternatively, roll the walnut-sized piece of dough into a log and then curl the ends in and pinch slightly to make a half-moon or crescent shape. Stud each cookie in the center with an optional whole clove and bake for 20 minutes or until just beginning to brown. When the cookies are still very warm, dredge in confectioners' sugar. (Handle them with care because they are fragile.) The sugar layer will almost melt and coat the cookies. After the cookies cool a bit, add another dusting of confectioners' sugar. Remove the clove before consuming. Store in a covered container with a light dusting for confectioners' sugar for up to one month. 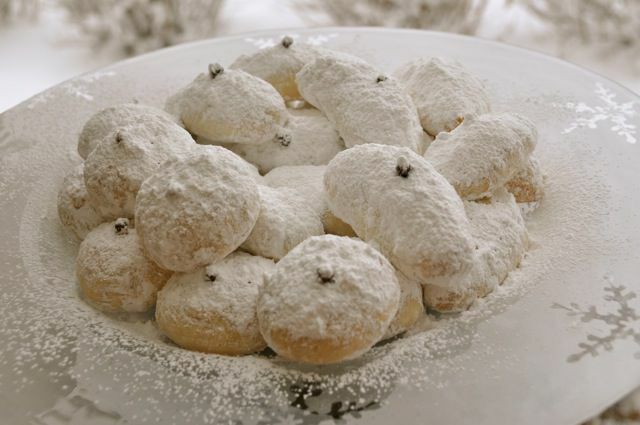 Kourabiethes are delicious served with tea, coffee, or a glass of ouzo. For the kiddies, a glass of milk would be in order. Since these cookies store well, they are a great make-in-advance treat that would be perfect for a sweets table.